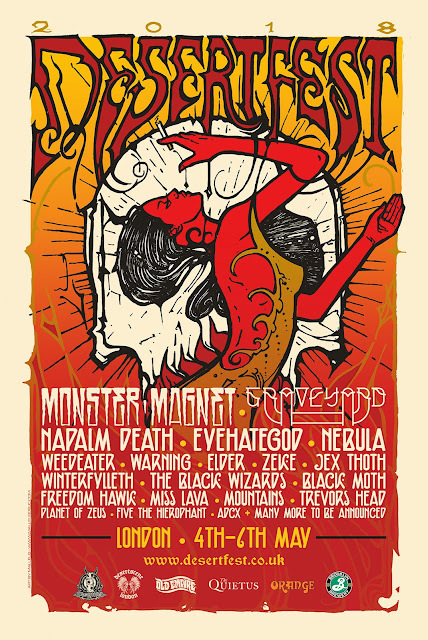 DESERTFEST LONDON are thrilled to reveal the bands taking part in the festival's annual Old Empire stage, that will be hosted on Friday 4th May at the Electric Ballroom in Camden. Our second artist comes in a wave of God-like reverence to Old Empire, a master of his craft – Patrick Walkers’ WARNING will bring the Electric Ballroom to its knee’s. One of the most poignant and genuinely dark British doom bands of all time, ‘Watching from a Distance’ is a masterpiece of the highest order. Having reformed for Roadburn 2017, we are thrilled WARNING will be joining us in London - all should know and all should follow. Another familiar face to the London scene comes in the form of WINTERFYLLETH. Hitting the Old Empire spectrum back in 2011, the Mancunian quartet have since consistently impressed with their unique and anthemic take on black metal. Helping to round of proceedings is FIVE THE HIEROPHANT, whose dark jazz soundscapes and eclectically heavy, yet perfectly refined, mix of sounds will make the live debut at Desertfest 2018. Alongside newbies to the scene ACDX - equal parts Isis, Hawkwind and Opeth. The dictionary definition of this Essex group would simply say, ‘indefinable’.